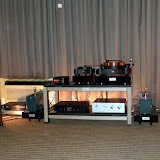 Yesterday, I attended the second annual Capital Audiofest. This year the event was hosted in a hotel in Rockville, MD. A very wide selection of audio equipment was on display and available for audition. Several audio industry celebrities were on hand including John Atkinson (Stereophile), Peter McGrath (Wilson Speakers), and Dan D’Agostino. Additional show coverage can be found here. Congratulations to show organizer Gary Gill for another outstanding event. I have posted my pictures of the event for others to enjoy.